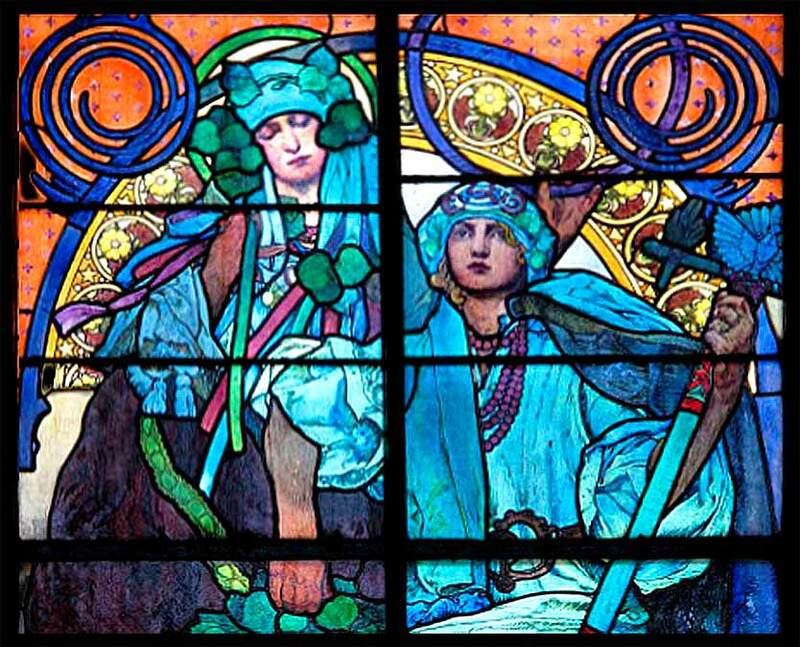 Saint (King) Wenceslas and his grandmother, stained glass for the Cathedral of St. Vitus, Prague, by the famed Czech art nouveau master, Alphonse Mucha, ca. 1931. The message of this song is wonderful. I’ll build an altar with the rubble that You’ve found me in . . . .
We have used the King James translation today, because it has such a nice poetic impact; but the passage is impossible to translate with perfect accuracy, because there is no graceful English verb corresponding to the Greek word (skandalon) translated as “offend”. What the original means is to trigger a trap or snare. If you've ever used an old-fashioned mousetrap, it's the little metal plate where you put the cheese or peanut butter; the mouse eats the cheese, pushes the little plate, and triggers the deadly spring-loaded trap. So that innocent-looking and attractive trigger — yummy, cheese! — hides a deadly result. This comes right after the admonition not to lust for an inappropriate woman, and that is the lead-in for talking about the eye as the trigger for a trap. We only sin when something looks good to us; we seek immediate gratification of some urge. But there are things we can have and things we can't have, no matter how inflamed our desire for them might be; they are the bait on a trap that will kill us. No sane person takes Christ literally here; this is not a call to righteousness through self-mutilation. (There actually used to be a small sect in Russia called the “Skoptsy”, in the 1800s, that practiced self-castration to avoid lust.) Adam and Eve, before the fall, had sexual desire, and eyes, and hands. In fact, it is the very ridiculousness of the analogy that makes it so powerful. There are two purposes to the Sermon on the Mount. The first is to extend the law into a new, broader morality of the heart and mind, to lead us away from thinking that external compliance with a specific set of rules will save our souls. The second is to demonstrate that perfect compliance with this morality cannot be accomplished, for we are born into sin. It is this second theme that Jesus so vividly expounds with the example of plucking out the offending eye. Our eyes and hands are not only part of us, but important parts, vital for survival, especially in the unforgiving society of the Roman Empire. The point is that we cannot live in perfect righteousness before God. Christ is illustrating our dilemma — not to make us feel bad, but because He is going to show us a way out of it. Matthew the Apostle, Russian Orthodox Icon ca. 1800. Notice, he is depicted holding a book.